1. Make it convenient – Try scheduling your workout session first thing in the morning, or on your way to or from work. A lunchtime workout can be convenient, as well as provide an energizing break in your day. 2. Make it social – Connect with people who share your interests. For example, join an exercise group, or workout with a partner. 3. Share and discuss what you are learning – about fitness, your body, nutrition, how you feel when you do and don’t exercise or eat healthier. This can be done with a friend, a group, a Health and Fitness Professional, or even in a blog. 4. Chart your progress – Keep an exercise log, write in a journal or blog, mark your completed exercise sessions on a calendar, have a fitness assessment and schedule re-assessment dates, or track distance goals for walking and running. 5. Make it fun – Do something different. Training for an event. Take a swim lesson. Workout with kettlebells. Kick up your heels and swing your hips in a Zumba class. Participate in a fitness challenge, or just take time to play. 6. Avoid all or nothing thinking – Use whatever time you have available to be active. Even a 10-minute brisk walk is sufficient to get the blood flowing, increase energy, and improve mental acuity. 7. 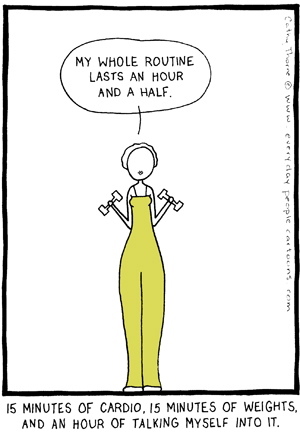 Make your exercise session YOU time! – Think of your exercise session as something special you are doing just for you rather than something you have to do. 8. Reward yourself – for the effort, not just the outcome. Celebrate the daily or weekly accomplishments, which are just as important as the big goals. I like to reward myself after a workout with a relaxing soak in the tub. 9. Engage your brain – Learn more about fitness and nutrition. Read success stories about people like you. Learn new exercises. Join a healthy cooking class or take a dance lesson. 10. It’s all in the Attitude – Focus on how good you will feel when you are done rather than focusing on all the other things you could be doing. Think about the progress you are making rather than how far you are from your goal. Motivation is truly a state of mind. This entry was posted in Exercise, Healthy Lifestyle, Inspiration, Returning to Exericse.